I started a new book on the plane last Saturday that has kept my imagination going. It’s a short little book that was recommended to me by a friend. The title of the book is, Dinner With a Perfect Stranger. The main character of the book receives an invitation to dinner with Jesus at a local restaurant. I won’t ruin it for you in case you want to read it for yourself, but it has caused me to wonder about some things. 1. How would I react if I opened the mail this afternoon and found an invitation to have dinner with Jesus? 2. How would I react if I attended such a meeting? 3. What would I ask him if I was literally sitting across the table from him? And then the most crucial question of all – why should my sitting across the table from him be any different than the way I approach him now? How would you react to meeting Jesus, literally face to face? Last Friday, I spent the day working on the house. We are doing some remodeling and so I had plenty to do. When Kristi got off work, she and Ethan joined me. I put Ethan to work cutting some 2×4’s in order to frame up a wall to make a closet. He did a great job and in a couple of minutes, we were ready to put them together. It was tight quarters so I handed the nail gun to him and I held the boards. As he set the nail gun on the board, he took his free hand and grabbed the board for leverage. He then fired a nail into the board – or at least that had been the goal. The nail hit the board at an angle and shot out side-ways. He dropped the gun and gave a yell. My first assumption was that the board splintered off and a piece had hit him. After closer examination I realized that the 16 penny nail had shot through three of his fingers – “nailing” them together! I would include a picture here but trust me, the sight was not for the faint of heart. But take my word for it, he nailed it! We then spent the next 2 hours at the emergency room having the nail pulled from his fingers. By the protective hand of God, the nail did not hit a single bone and at this point, other than some puncture wounds, there does not appear to be any lasting damage! But as I stood there in that ER with Ethan, I could not help be feel responsible. I wished with all my heart that it had been me and not him that took the nail. But all I could do was stand beside him and try to comfort him. As I have reflected on that experience it has made me wonder: in some very small way, I wonder if those feelings I had were not unlike the feelings God had as Jesus took the nails for the cross event? Have you ever experienced having to watch a child suffer? As I said yesterday, this past Sunday we talked about the importance of God’s living and relevant word. As part of that sermon, I challenged our people to spend a minimum of 10 minutes, three different days this week reading the Gospel of John. So yesterday, I spend some time in the John chapter 1. As I read about the Word becoming flesh, I was reminded that when Jesus came to earth, he came as a light in a dark world. But not everyone recognized or acknowledged that light. Verses 11-13 tell us that not all received him, but to those who did (and do) and to those who believed in his name, Jesus gave them the right to become children of God. Think about that a minute. Because I have received Jesus and I believe he is who he said he was, I am now a child of God! God is my Father! Not in the sense of a physical birth or natural decent but born of God. I don’t know about you but when I stop and think about that, I am humbled and excited. What about you? Have you received Jesus – do you believe he is who he said he was? Yesterday in our worship service, we talked about the importance of God’s word. Think about those two words used together – God’s word. The very words of God. 2 Timothy 3:16 says that scripture is God-breathed. The image is the same as that given in Genesis 2 when God breathed life into the first man. God breathed insight and understanding into those authors all those years ago. Their eyes were opened to see God’s desire and God’s truth. The word was true and relevant. It was given to the world for instruction and conviction – to train people to be all that God desired. But what about today? Is God’s word still true and relevant? Nothing has changed to make the word less true today as it was when the ink was drying on the parchment. But what about it’s relevance? I ran across an article last week from Jim Dennison that reminded me of a seminary professor we both sat under at Southwestern Seminary years ago. Yandall Woodfin taught theology and the philosophy of religion. He wrote a book entitled, With All Your Mind. In that book he made the statement that human nature does not change. Think about that for a second. Throughout the history of the world, things have been in continuous change and growth. But one thing has never changed – human nature. People are still basically self-centered and sinful. Because of that fact, God’s word is just as relevant today as it was the day it was written. God’s word is alive – it is relevant – it is true – and it is written so that we might know how to live as God created us to live. So how much time do we spend with it? Yesterday, I told you about my concrete saw trials. What I did not tell you is that I did finally get the concrete cut in the bathroom. Unfortunately, I did not return to that particular project until last night. But, I had help! Some help came from an 80 pound electric jack hammer. But most of the help came from my son. Ethan was a huge help as we broke out the concrete that I had cut last week. Then we dug a hole in the slab of the bathroom almost 3 feet deep. Neither of us had ever dug a hole in the house before. It was kind of cool! But you know what the best part of the evening was? Working side by side with my son. It was a pretty manly project! Thanks Ethan for your help! I don’t suppose you would want a jack-hammer for your birthday next week would you? Ever heard the phrase, “Practice what you preach”? Last week I had to do that. On Sunday the 9th I preached on loving mercy from Micah 6:8. I reminded our folks that one of the things God expects is for us to show mercy just as God has been merciful to us. Last Friday, Kristi and I were set to work on the house. 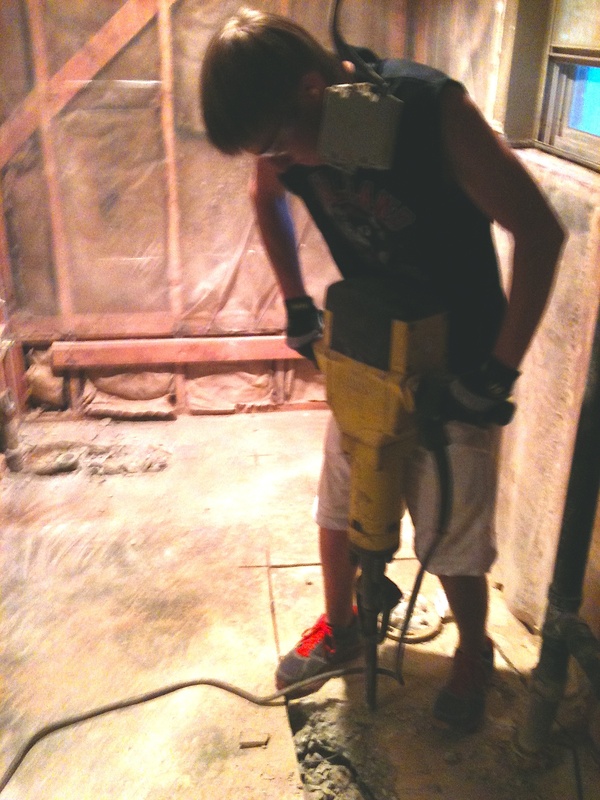 I rented a concrete saw in Levelland and we headed to the house. I went straight to work cutting some brick with the saw – rentals are done on an hourly basis and I wanted to get the work done quickly so that I could get the saw back to the rental center and not spend any more money than I had to. I started the work and made it about 3 feet before the switch went out on the saw. I called the rental company and all they could say was, “sorry, I guess bring it back but we don’t have another one.” I was frustrated but there was nothing anyone could do so I loaded it back up in the car and made the 25 mile drive back to the center. I began to call around different places in Lubbock to see if I could find one there. On my second call I found one! And what made it even better, it was the same price as the one I was returning but instead of being a four hour rental, it was for a whole 24 hours! Wow, this was going to be much better. We drove to Lubbock and walked into the rental department. I told the young man what I needed and he said, “Oh yes, I talked to you on the phone earlier – that saw is right down this aisle.” We headed down the aisle toward the saws and he stopped and turned to me and asked what to me is one of the most insane questions I have heard in a long time. Well, long story short, to get a saw for 24 hours that actually comes with a blade is double the cost of the quote on the phone. At that point, I was beyond frustrated. That was a little tid-bit of information that I would have liked to have known prior to making the 30 mile drive to Lubbock. I am not sure it would have changed my plans because I had to have the saw, but none the less, not a surprise that I wanted. But then I remembered – love mercy! Obviously, I am not over my bitterness even today but I am smiling about it and thinking to myself, I need to be careful what I preach. What about you – have any stories to share about having to show mercy? This morning, I wonder – – who do you belong to? If you are a believer, if you have made a decision to follow Jesus, then you are a child of God! You belong to the Creator of the universe! Regardless of what you might be facing today – remember – you are a child of the King!